I have been working on a new bible study guide for Mike to use with his many school bible study groups in rural Kenya (more exciting details below). It is an overview of Proverbs, and as I did so, I was reminded of the incredible changes I have personally witnessed as I studied the Bible over several decades! As a new believer, some 40 years ago, I memorized many scripture verses in the King James Version. I remember so many fellow church goers would criticize the “new” versions such as the NIV or Living Bible, insisting the REAL bible was the KJV!! I saved money for weeks to be able to buy my Thompson Chain Reference Bible ($60 at the time – half a week’s wage!!) so that I could do my own bible study. I still have that much-loved bible even though it is now extremely tattered after so much use! Yet today we have unlimited access via the Internet to awesome resources such as on www.biblegateway.com where in an instant we can look up bible verses in over 50 English versions and translations into over 60 other languages! It also has a topical index, commentaries and bible dictionaries. Another great website is www.biblehub.com which has multi-version bible concordances, bible encyclopedia and much more…. and all of this is FREE!! What a HUGE blessing!! Hmmm….I just wonder how many Christians today make use of and appreciate these wonderful tools! There is just SO MUCH POTENTIAL for the Church today to study and spread God’s Word! Sadly I am reminded that in Africa and so many other parts of the world, people are still living with the limitations of 50 years ago – struggling to obtain ANY copy of the Bible for themselves, and never even seeing a concordance or bible dictionary to aid them in their personal bible study. It was almost 5 years ago when Mike shared with me these needs especially for students as he began to disciple those who responded to his evangelistic events in area schools. That part of Western Kenya is favored for boarding schools, as it is at a higher altitude and thereby cooler. But being fairly remote (though well populated) it was difficult to obtain bibles in large numbers, and shipping was expensive and unreliable. Our many failed attempts to help provide published resources prompted me to start writing the special “Exploring God’s Word” series, designed for use in student-led bible study groups. A guide for each New Testament book can be easily printed out on a few sheets of letter size paper for each student. Each chapter of the book is broken down into small passages that can easily be read and considered one by one. Key points of the passage are noted, along with a key verse from each chapter suitable for memorization (using a more modern version such as the Easy-to-Read version.) We have added a few simple definitions or important factual information just to make clarification. Mike reports that now he visits 6 schools on a weekly basis, some with more than 1000 students. There are multiple bible studies being held in each school and some schools have up to 40 groups, with hundreds of students being discipled! Word is getting around and he is also invited to hold evangelistic events in other schools, which leads to even more such groups. He continues to do other areas of children’s ministry also, so please keep this faithful man in your prayers. 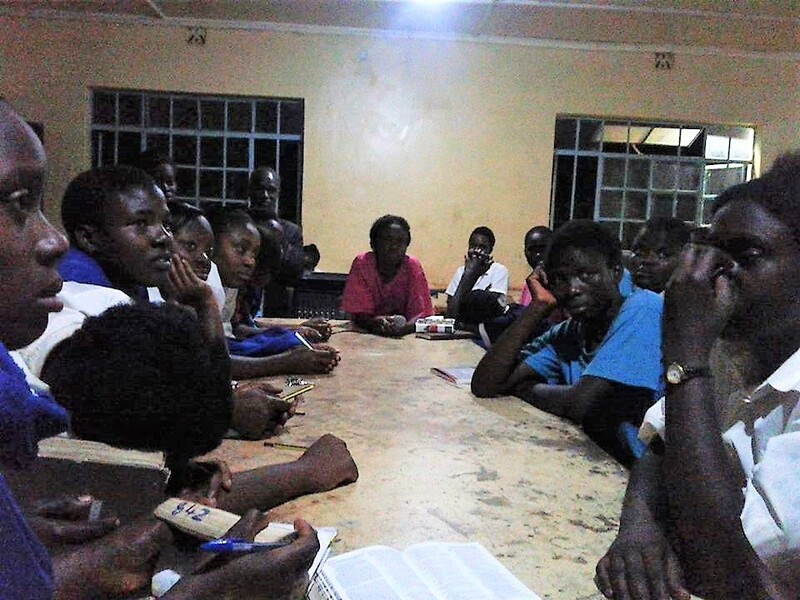 The photo shows a school bible study group. Pastor Honoré in C.A.R. reports that there has been no electricity for the past month in their area, and there was renewed violence in Bangui last week, resulting in the death of one of his pastor friends, whose home and church were also burned down. He hopes to send a more detailed report soon but we definitely need to keep him in our prayers! Pastor Sika in Togo briefly wrote to tell us that he has again been very ill with a recurrence of malaria (among other issues) and his wife Lucie also had to go to hospital with blood pressure problems again. Thankfully we can report that we received some special donations totaling $700 to help with the construction of the new building, so hopefully work on that will be able to continue again soon. 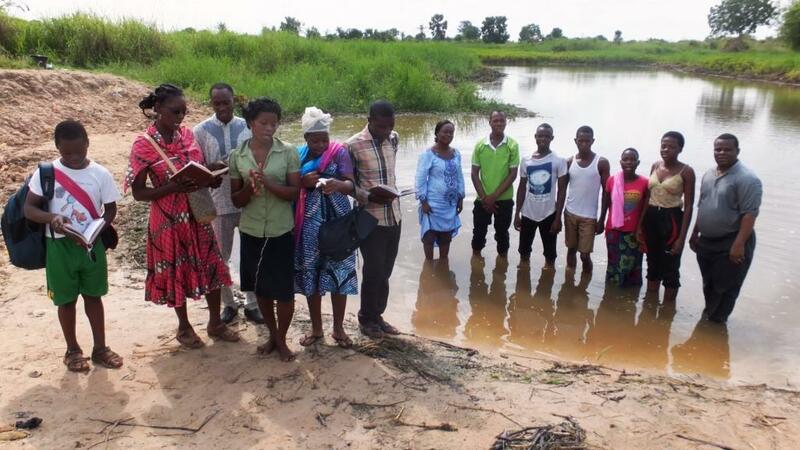 This photo shows Pastor Sika and Lucie at a recent baptism near Lomé.